WASHINGTON, Dec. 18 (Xinhua) -- U.S. special envoy on the Democratic People's Republic of Korea (DPRK) will travel to South Korea later this week, said the U.S. State Department on Tuesday. 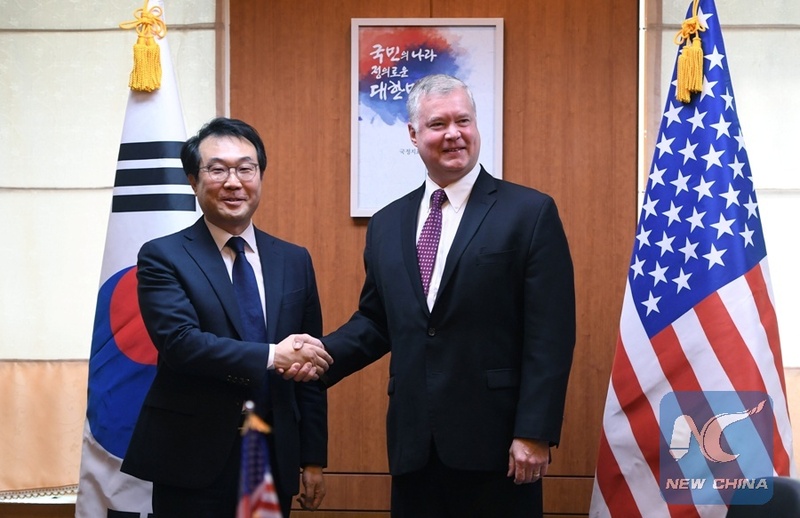 Stephen Biegun, U.S. special representative for the DPRK issue, will visit Seoul from Wednesday to Friday, when he will meet with Lee Do-hoon, South Korea's special representative for Korean Peninsula peace and security affairs, to further strengthen bilateral coordination on the peninsula denuclearization, said the department in a statement. During his stay, Biegun and Lee will also co-chair a bilateral working group meeting to achieve the goal of denuclearization, including through inter-Korean cooperation projects, the statement added. Biegun's visit came at a sensitive time when Pyongyang darted harsh words on Washington over the weekend for imposing sanctions against senior DPRK officials, criticizing the U.S. State Department for being "bent on bringing DPRK-U.S. relations back to the status of last year which was marked by exchanges of fire." Meanwhile, Pyongyang and Seoul has been on the track of forming a closer relationship. The two sides will hold a groundbreaking ceremony next week at the Panmun Station in the DPRK's border town of Kaesong to modernize and eventually connect railway and road across the inter-Korean border. Chinese State Councilor and Foreign Minister Wang Yi said recently that China encourages the United States and the DPRK to advance denuclearization on the Korean Peninsula.